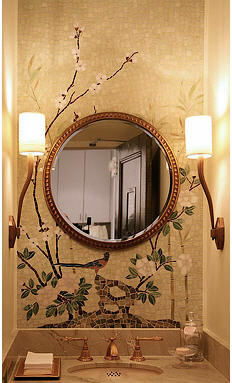 I thought I`d start off this post by describing what Chinoiserie is. 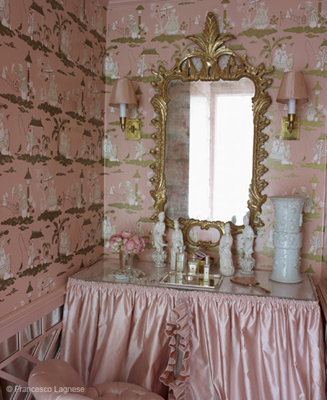 Sure I can point out pretty wallpaper and say yes that is chinoiserie but do I know it`s origin? Did it originate in China? Nope, it's European. 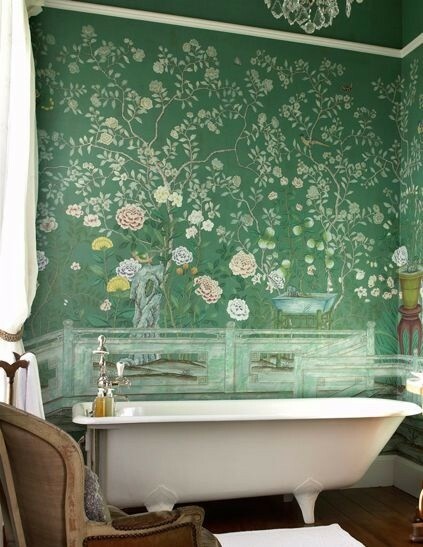 Can I identify what is chinoiserie and what is not? Well I wasn't sure so I decided to do some research. After reading up on it on Wikipedia (of course! ), Britannica and a bunch of other sites, I came across a great article. It is so detailed and so well written I don't even want to attempt writing my own (ok, and I'm also feeling a bit lazy after all that reading). This one is perfect, so why mess with perfection I say. 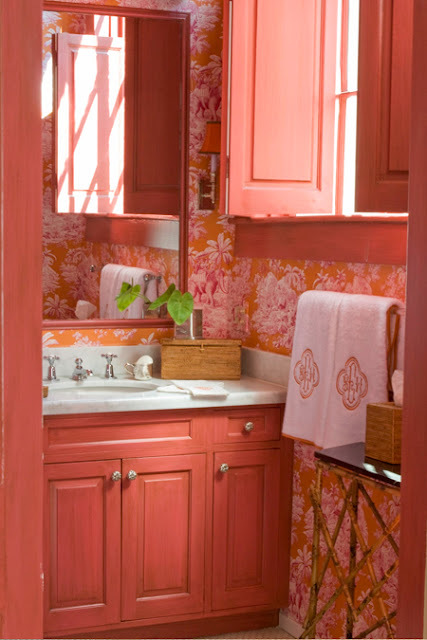 Sure you can just scroll thru the pretty chinoiserie bathroom photos without learning the background of chinoiserie, but it has a pretty interesting history and this article could make you look like a star at the next dinner party you attend. Imagine it, you are sitting at the most boring dinner party and you just can't think of anything to talk about plus you left your cell in your bag so you can't do a fake 'emergency' call. What to do? 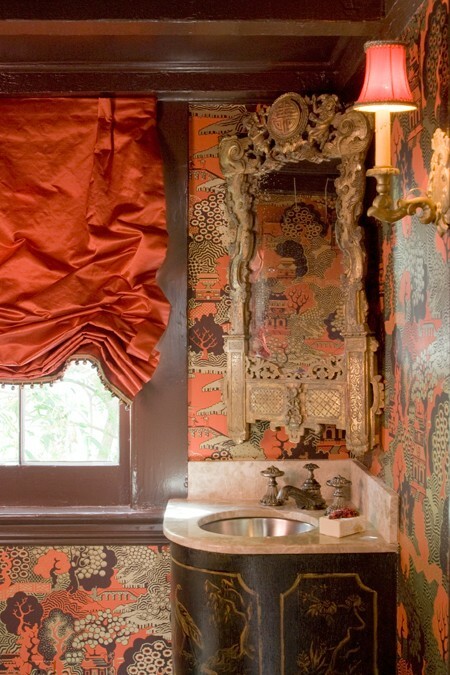 Look around if there is beautiful chinoiserie decor in the house and then marvel your hosts with all that you have read about it. 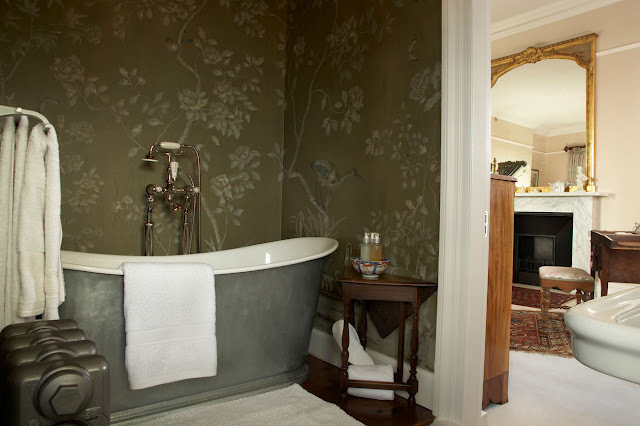 And if you still need an out, while they are all taking a closer look at the designs in the chinoiserie you can go check your phone for that 'emergency' call and make a dash out the door. Chinoiserie saves the day! Not bad for reading a great article. 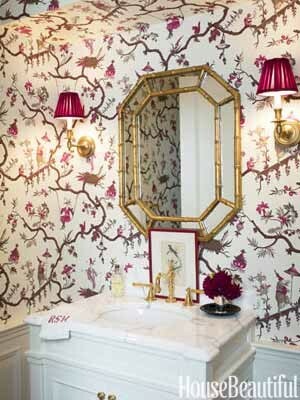 I particularly like the idea of using chinoiserie wallpaper in a powder room because there is so much detail in the designs. 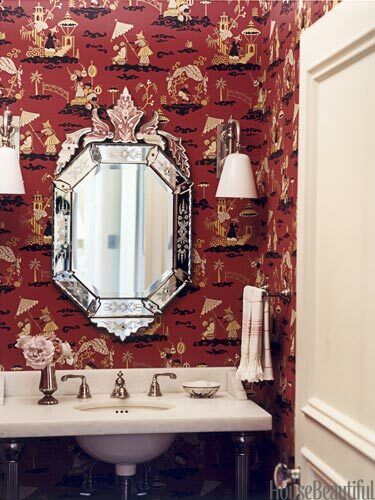 You can find chinoiserie wallpaper with everything from fantastical floral motifs to whimsical elaborate designs with monkeys dressed in fancy outfits and princes carrying gorgeous umbrellas riding decorated elephants to exotic floating palaces and dozens of other enchanting scenes. 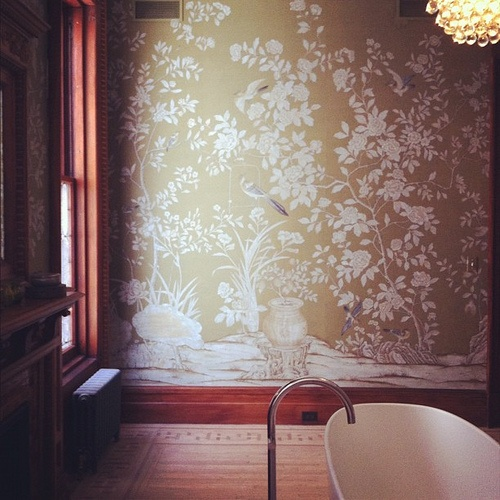 Chinoiserie wallpapers are the perfect backdrop for a nice sit and daydreaming in the loo. 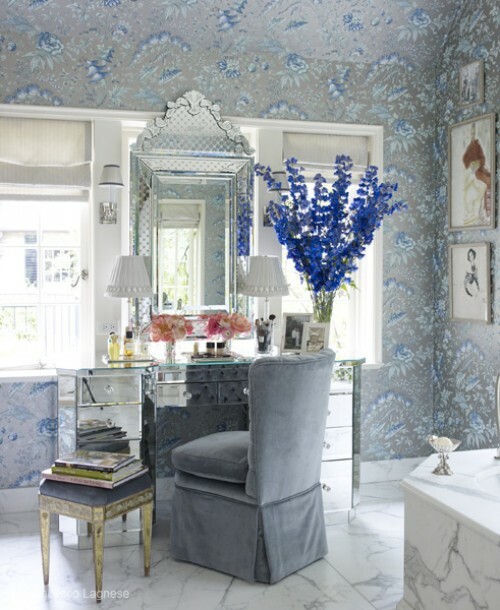 In decorating chinoiserie is often paired with more modern furnishing. I think the same rules can apply in the bathroom. 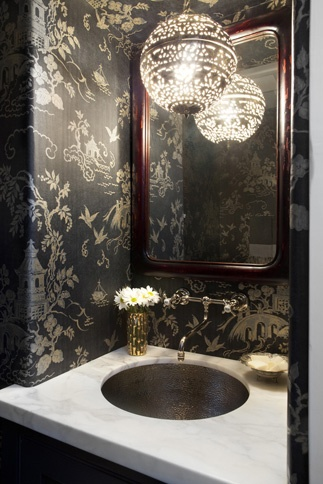 Pairing chinoiserie wallpaper with a sleek modern tub, modern vanity and modern fixtures is just breathtaking. And if you want to see a bathroom that used white and red chinoiserie wallpaper for a dramatic and eclectic effect check out this other post I did: here. 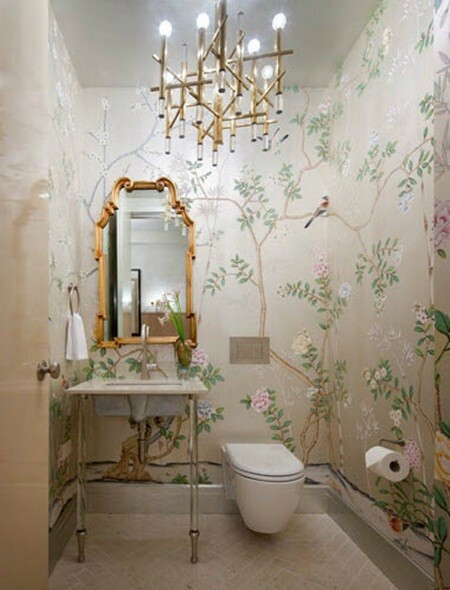 I know this post is all about chinoiserie, but the first thing that caught my attention was the wall-mounted toilet! I thought the wall behind a wall-mounted toilet needs to be tiled, but I guess not :-) Good to know! 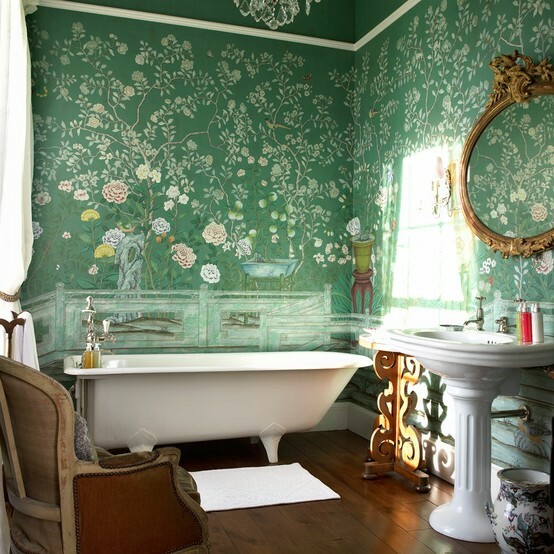 As for chinoiserie... thanks for sharing the article, it's really interesting. Especially the part about how in the 13th century, goods were carried from Asia to Europe by cart & camel. Imagine how long that must have taken! Kelly, I am going to look into the toilet hanging situation and get back to you with what I find out. all of these wallpapers are SO me!! I love them too! 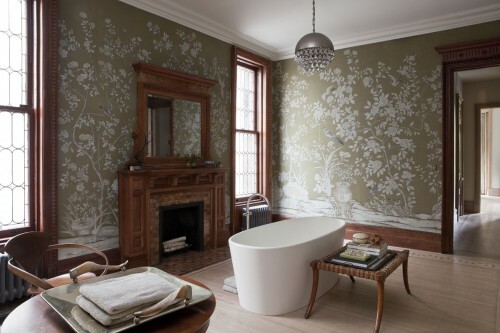 It's hard to choose a favorite, but I do really love the green chinoiserie wallpaper alot.